Our New Associate Pastor is here! Filed under: News |	Comments Off on Our New Associate Pastor is here! The whole congregation worships together in the summer, beginning on Memorial Day Weekend, May 27, 2018. Every week is going to be fantastic! Come and be a part of it. Visitors Expected! There is ALWAYS a place for you & your loved ones here. 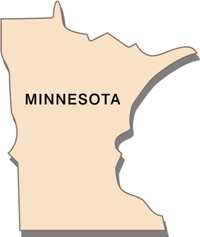 Click the map of MN (lower right) for directions. The free, full-color devotion book which accompanies this series will be available to all households starting February 14. Invite a friend. There is a place for you here. Whatever you might be struggling with – illness, recovery, grief, the holiday overwhelm – you have a God who knows, and a church community who cares. First Lutheran of Blooming Prairie dedicated the sanctuary at 434 First Street SW to the glory of God 50 years ago on April 30, 1967. We are gathering to celebrate all the ministry done in Jesus’ name & re-dedicating ourselves to God’s mission here as The Welcome Place. Music, worship, stories, conversation…some surprises in store…and we’ve curated a look at our archives, too. Visitors expected! For campers and weekend cabin goers, join our livestream!